This paper discusses findings that establish the ageing-induced compositional and crosslinking gradients across the depth-profiles of two accelerated aged natural resin varnishes: dammar and mastic, which are commonly applied to paintings. 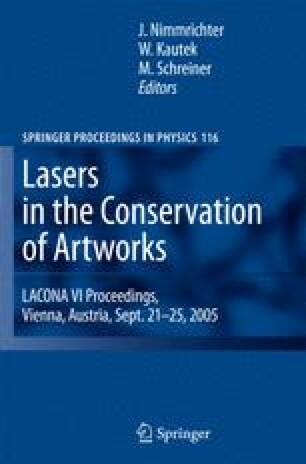 Profile measurements of laser-processed films using a KrF excimer laser, as well as online measurements of the C2 emission by laser-induced breakdown spectroscopy (LIBS), showed a significant reduction of the ablation step and ablation yield with depth, respectively. Direct temperature mass spectrometry (DTMS) showed that the oxidation products formed upon ageing were gradually eliminated across depth, which affected the depth-wise optical properties of the films studied by UV/VIS spectrophotometry. The total ion currents of the DTMS in the electron ionisation mode (EI, 16 eV) demonstrated also a gradual reduction of the pyrolysis yield which corresponded to a gradual depth-wise elimination of the high MW fractions that was confirmed by size exclusion chromatography (SEC). The gradients were established also by surface analyses, such as matrix-assisted laser desorption/ionisation-time-offlight- MS (MALDI-TOF-MS) and attenuated total reflection-Fourier transformed infrared spectroscopy (ATR-FTIR), which indicated that the action of the KrF excimer laser is non-destructive to the varnish when optimal fluences are used for the laser cleaning process. The extracted data enabled the quantification of the compositional gradients and unraveled a significant feature of natural resins, which would not have been possible without the use of KrF excimer lasers.